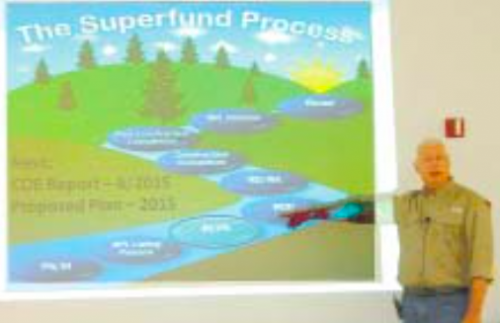 EPA Staff Member Gary Miller, points to a chart that explains the many steps that are required to study and process a Superfund Site before any action can be taken on the ground. CHANNELVIEW – After a series of meetings over the last two years that have taken place in Highlands, the federal EPA agency decided to expand the audience by holding the latest meeting last Thursday evening in Channelview, at the Flukinger Community Center. There were several obvious reasons for this change in venue. One, the study area has now been expanded to include the South Impoundment below I-10, which is closer to the Channelview residents. Two, the EPA wanted to be sure the residents on the west side of the San Jacinto River were made aware of the dangers of fishing and recreation in the immediate area next to the Waste Pits. And three, the Superfund Process is long and slow, and this change in venue makes it seem like more is happening than really is. The audience, partially from Channelview and many from Highlands, listened to EPA staff Gary Miller, Donn Walters, and facilitator Mary Jane Naquin, give an update on the status of the process. Also present at the meeting, observing but not speaking, were the Harris County Dept. of Health, and staff from TCEQ. Miller showed slides, which included a short history of how the wastes got to the site and when, and then a short dissertation on the types of toxins that could be found in the soil at the site, mainly dioxins and furans, with PCBs in some areas. He made the point for the new members in the audience, that dioxins are known carcinogens, and do not deteriorate with age. He showed that the waste pits were now covered with a temporary “cap” consisting of a geo-membrane, with a rock fill on top to hold it in place. This cap is what the PRP, or responsible parties, want to call permanent, but many including the San Jacinto River Coalition and the Galveston Bay Foundation, feel is not a satisfactory solution. 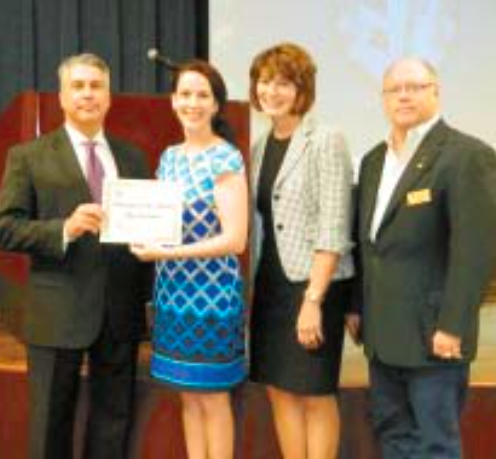 KEYNOTE SPEAKER DR. BRENDA HELLYER, second from right, joins in congratulating the San Jacinto College Outstanding Educator, Amy Ammerman, with Mike Williams of the North Channel Chamber, and Dan Mims of the San Jacinto College Board. NORTH CHANNEL – The Monument Room at San Jacinto College North was packed with students, teachers, and guests wanting to hear the San Jacinto College Chancellor, Dr. Brenda Hellyer, a favorite educator and leader of that institution. In her keynote talk, Dr. Hellyer gave a status report on the college, and then went on to describe the changes taking place in education and at San Jac, and her vision of the future of the institution and education in general. She said that the college now has about 30,000 students, of which 8300 are at SJ North. Continued growth has spurred a building program, including a new library and a new Center for Industry & Technology under construction on the North campus. San Jac serves 6 of the surrounding school districts, including Galena Park, Sheldon, Channelview, LaPorte, Pasadena, and Deer Park. Current programs which she detailed include an accelerated Math program, and MECA, or Modified Early College Academy, for high school students who then get college credit. She said they now have two of these programs in place, with more to come, including Galena Park ISD. The City Charter has not been updated since 1979, more than thirty-five (35) years ago. Many of the articles in the City Charter are outdated and should be brought up to current standards. The City Council appointed a Charter Review Commission of fifteen (15) citizens to study and recommend updates to our Charter. The Charter Review Commission studied the charter along with many other small Texas cities and submitted their suggestions to the City Council. The City Council approved the recommended Charter Amendments to be submitted to the voters of Galena Park for consideration. Our Special Charter Election will be held on Saturday, May 9, 2015 between the hours of 7:00 a.m. to 7:00 p.m. to submit to the qualified voters of the City of Galena Park, Texas, various propositions for amending the City Charter. Please refer to www.cityofgalenapark-tx.gov for the full Notice of Election. Amend the City Charter of THE CITY OF GALENA PARK, TEXAS to designate the Mayor and Council Members as the City Council. Amend the City Charter of THE CITY OF GALENA PARK, TEXAS to provide for a Department of Community Development. Amend the City Charter of THE CITY OF GALENA PARK, TEXAS regarding the appointment, qualifications, compensation, term and removal of the Fire Chief and Fire Marshal. Amend the City Charter of THE CITY OF GALENA PARK, TEXAS to establish a Police Department and the office of Police Chief and to prescribe the qualifications and duties for that office. The latest news and information from schools in Channelview ISD are now available on smartphones and mobile devices with a new mobile app launched this week. The district has partnered with SchoolWires to expand its communications outreach with a mobile app that is now available in the online iTunes® and Google Play® app stores for free. The Channelview ISD mobile app will offer a constantly updated feed of district news and events with photos and links to the district’s mobile responsive website. The app can also be customized by the user by selecting the schools they are most interested in for news and updates. Users can also choose to receive push notifications to get breaking news and updates about school closures, calendar changes, or even sports updates. The 40th Annual North Shore Rotary Catfish Fry, Crawfish Boil & Auction will be held Saturday May 16th at the North Shore Rotary Pavilion on Wallisville Road(behind the Fonteno Courthouse Annex). Live auction begins at 12:30pm. 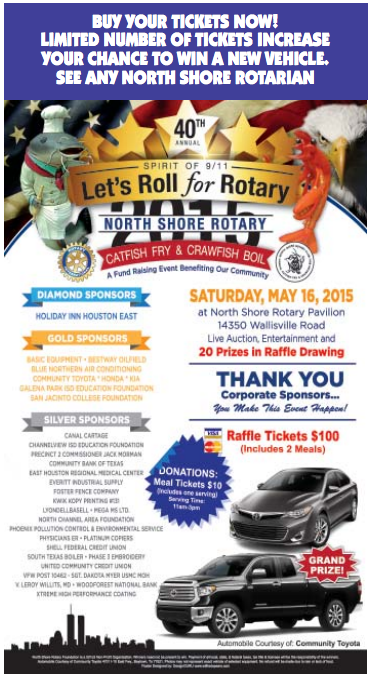 See any North Shore Rotarian for meal ($10) or raffle tickets ($100 – ; Grand Prize is Toyota Truck). Contact Event Chairman Mike Williams at 713-560-2810 for more information.